Schoenhut Toy Piano Company has donated a majority of the musical instruments for The Inspire Foundation and The Inspire School of Music & the Arts' classrooms and summer music camps. Several of Schoenhut instruments are rated by Able Play, a company that researches, rates and reviews play products for children with special needs. Owner's Renee and Len Trinca, are so excited to become a part of The Inspire Foundation's mission to ensure every child has the opportunity to experience music and the arts. The Rascals at Inspire just wouldn't be the same without our marching drums, they go hand in hand. Our Rascals love making beats with their tunable drums! Inspired by the Schoenhut piano! Owner of Schoenhut, Renee Trinca. Ryan Judd and The Rhythm Tree have recently partnered with The Inspire Foundation. Ryan Judd is a board certified music therapist and specializes in working with children with special needs. His mission is to teach parents, educators and therapists how to use music to help children with special needs learn, grow and thrive. This partnership we will ensure that all children have the opportunity to experience music and the arts! 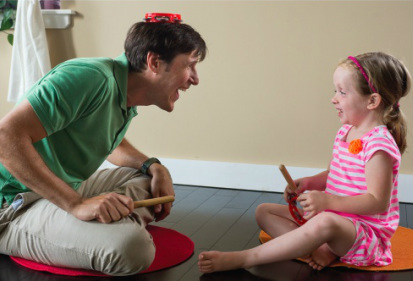 The Rhythm Tree DVD and Music Package will provide our parents and educators with everything they need to bond with their children and help them develop self-esteem, motor skills, social skills, academic skills and speech/communication skills. This music package received ★★★★ in the categories of Sensory, Communication, Cognitive and Social-Emotional Development from an independent review done by AblePlay, the leading authority in toys and products for children with special needs.